Toss a coin in the Trevi Fountain and you are sure to return to Rome, the Eternal City. One stay in this first floor walkup and you will never want to leave. 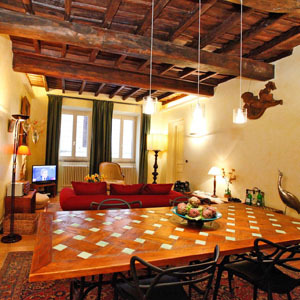 Flavia is a lovely apartment filled filled wilth light located in a 17th century palazzo on a pedestrian street in the heart of Rome. Close to both the Trevi Fountain and the Spanish Steps, it is the ideal location for sightseeing - perfect for exploring all of ancient Rome on foot. Walk to the Spanish Steps, the Campo dei Fiori, the Pantheon and the Forum. Flavia is beautifully appointed, with comfortable furnishings and wood beamed ceilings. Walk up the marble staircase and enter into the spacious and inviting dining room/living room, with unique dining table with inlaid wood and hand made French tiles. From the dining room table, towards the front of the apartment is a cozy living room area. Behind the dining room is the galley kitchen, small but functional. Here is the closet where the washing machine is located. The Queen bedroom is reached right off the dining room and the Twin bedroom off of the living room area. each bedroom has another door, leading to a short hallway where the bathroom is located. The bathroom is split into a two rooms, you first enter the sink area with a large built in closet and then a door opens to the rest of the bathroom with Jacuzzi shower. Stove, Oven, Refrigerator, Freezer, Dishwasher, Washer and Dryer, High Speed Internet Access, TV with Italian Channels, DVD, Stereo, Wifi Internet, Safe, Telephone available for incoming calls - can use a phone card for outgoing calls. Security Deposit payable by check to Papavero Villa Rentals and refunded no later than one month after your departure from the apartment, less any unpaid fees or damages.